It's not often that my little ol' blog is contacted to do a product review. And it's even less frequent that I accept an offer to do a product review because, let's face it- there are some weirdos out there. 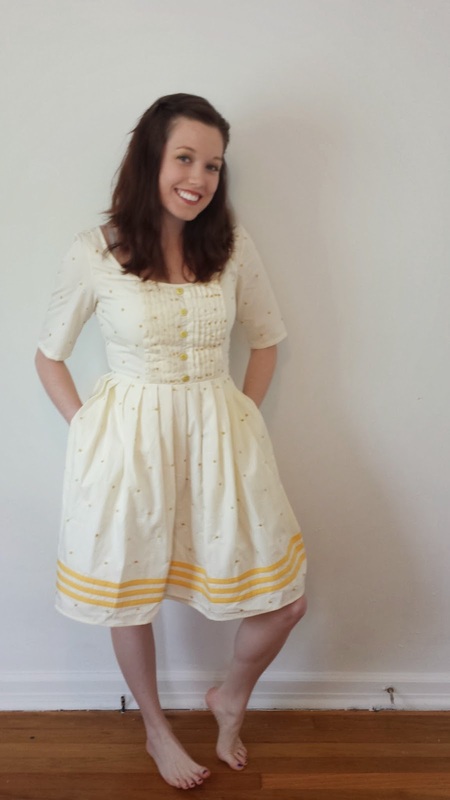 However, I had seen some of my favorite bloggers talk about eShakti before and I loved the concept of a website that offered affordable (and I actually mean affordable, I buy almost all my clothes secondhand) clothing that was customizable. After searching through a ton of options, I decided on a dress straight out of a Stepford Wives' closet. When it comes to dress sizes, I'm a pretty standard size 6, but I wanted to test out their customize option, so I decided to change the sleeve length to a 3/4 sleeve and add pockets. Because who doesn't love pockets?! My order arrived about 2 weeks later, I'm assuming because 1. The customizing would take awhile and 2. The dress was shipped from India. 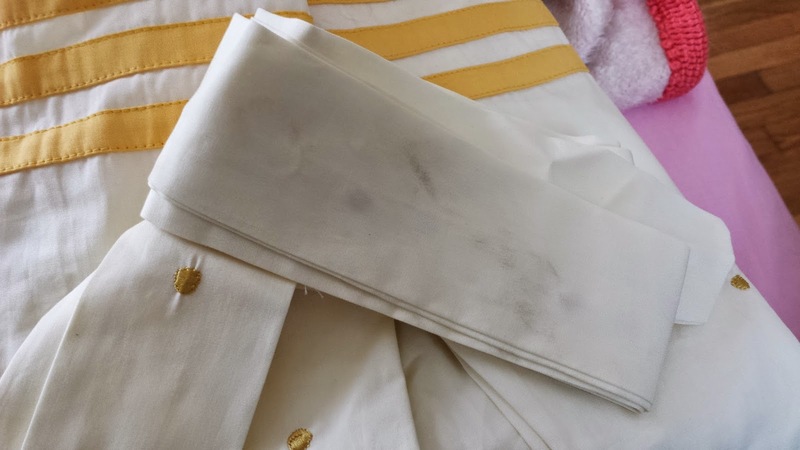 Very visible smudges on the included sash. When I opened up the package, there was a small sash (that I'm still unsure of how to include in the ensemble) that was a little dirty, so my first impression was a little dismayed. There were also a couple loose threads on the dress that I promptly picked off. Upon trying on the dress, I was pleasantly surprised, however. It fit me like a glove and I was totally smitten with the included pockets. My only criticism would be the tightness of the sleeves. I was very restricted in the shoulder area and when I later decided to toss Frisbee with my Hubby, heard an audible tear when I reached to catch a high-flying toss. May I suggest not playing Frisbee in a brand new dress? 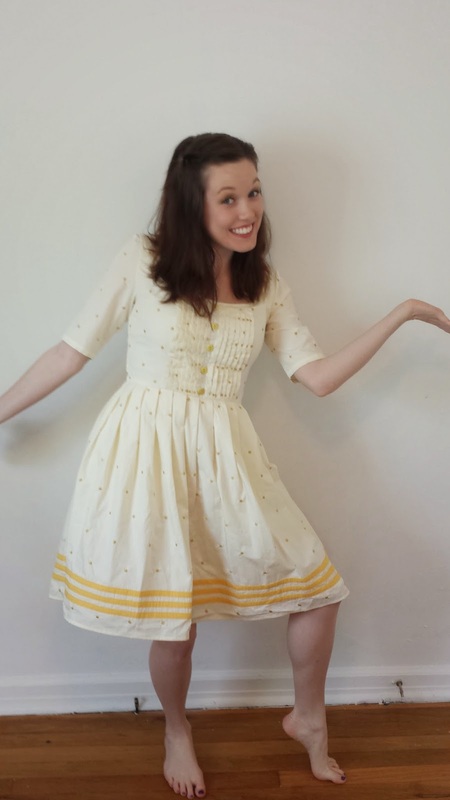 Overall, I give eShakti a 'B' rating. Would I order from them again? Possibly. I don't know that I would regularly shop with them, but if I wanted a custom fitted dress for a wedding, shower, etc, they would be the first website I would look to! Also, I clearly should never model clothing ever again. 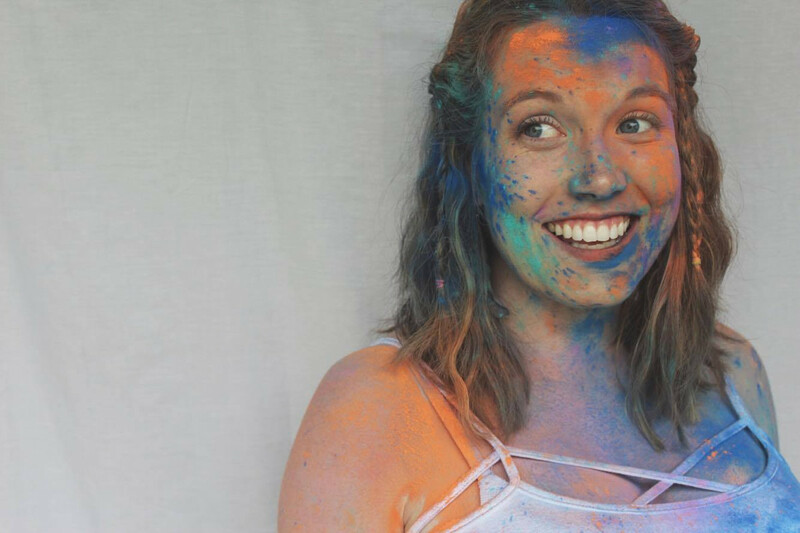 If you're interested in trying out eShakti for yourself, you can get $25 off your first order when you sign up! Considering most of their clothing is in the $50 range, that's half off! And if you do order from them, let me know what you think! Such a bummer that they sent you something visibly dirty, but I think you look adorable! If it makes you feel better I just got an order from Express and the item was dirty... I suppose it can happen with any company, and is definitely a bummer! Cute dress! !